Campo Azul Tequila Blanco is made from 100% Blue Agave, and the results of a delicate process. Campo Azul Select Series is a line of products specially developed for aficionados with a demanding palate, that enjoy products of quality and finesse. 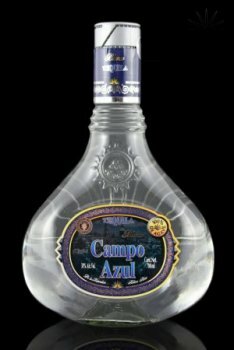 The full line of Campo Azul Tequilas carry an authentic hologram, partially covering the cap of the bottle, to guarantee the quality and safety of the contents. Tasted out of snifter 06/22/08. Campo Azul blanco was a pleasant surprise. Since it was very inexpensive I was a bit worried it would have a big alcohol burn, but the burn was not too bad. A solid 'B' in my book. Aroma: Nice agave and earthy aroma. Initial Taste: A thin mouth feel. Starting off with peppery tones. Body: A very nicely balanced agave, earthy, and spicy presence. Finish: Of medium duration, slight alcohol burn, but nothing to be 'bitter' about(haha). Like I said, a solid 'B' grade from me.